On Wednesday, Gov. 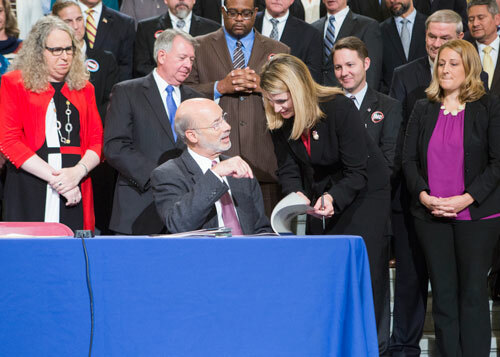 Tom Wolf signed legislation into law to address Pennsylvania’s ongoing opioid addiction crisis. The governor signed House Bill 1699, which was sponsored by Rep. Rosemary M. Brown (R-Monroe/Pike). Brown’s legislation, now Act 122, will take effect in 60 days. HARRISBURG – To address Pennsylvania’s ongoing opioid addiction crisis, Gov. Tom Wolf signed into law House Bill 1699, which was sponsored by Rep. Rosemary M. Brown (R-Monroe/Pike). Brown’s legislation, now Act 122, will take effect in 60 days. Act 122 mandates that hospital emergency departments and urgent care centers may not prescribe opioids in quantities that last more than seven days and they may not write refills for opioid prescriptions. Brown’s video comments are available at youtube.com/RepBrown. For more information about this legislation, or any state-related issue, contact Brown’s district office in East Stroudsburg located at 143 Seven Bridge Road, by calling 570-420-8301. Information can also be found on online at RepBrown.com or Facebook.com/RepRosemaryBrown.